It happens that a commenter asked about the Hayward fault hazard in an area that I surveyed only yesterday, just south of the part of town I discussed back in January under “The 35th Avenue cut, Jordan swale and the Franciscan spike.” This post looks strictly at the Hayward fault between 35th and 39th Avenues and not, as I usually prefer, at the bedrock (there’s almost none to be seen here anyway). Here’s the fault trace, as mapped in 1992 by the US Geological Survey. First, note that the map is tipped clockwise to make the fault run vertically. The fault is mapped here with an uncertainty of less than 40 meters; the ticks on the dashes indicate the downhill side. To help orient you, here’s much the same area in Google Maps, tilted to match. The two arrowheads mark where the fault is mapped and the two numbers are the localities I’m showing below. The lower arrowhead coincides with the fiduciary mark on 39th Avenue. 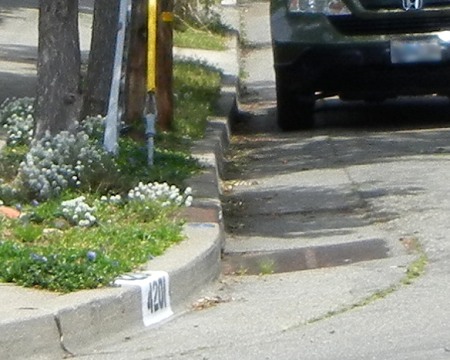 The first locality is the lower end of Dunsmuir Avenue at Victor Avenue, where the street curbs are offset to the right. The offset is more subtle on the south side (to the right in this view). The pavement on the corner is cracked, but that can happen when a garbage truck cuts across it, to name just one possibility. But there is an offset there, along with a recent sawcut to help gauge any motion there. 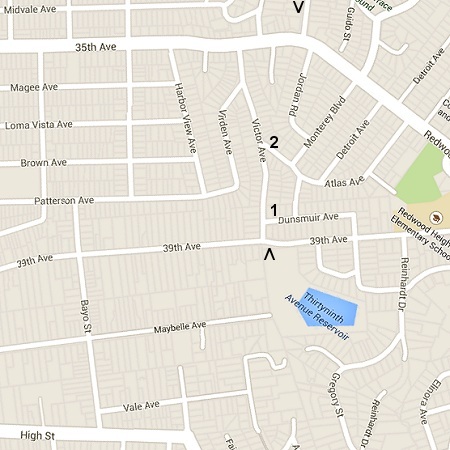 To the north, the next street to cross the fault trace is Atlas Avenue. The curb is offset there, too. The features marked “G” are geomorphic ones, G2 for “distinct” and G3 for “weakly pronounced.” The codes are as follows: sl, linear scarp; lv, linear valley; ss, swale in saddle; df, fault-related depression. The land is weird here. Drainage from the reservoir area appears to run north instead of west, perhaps feeding the head of Courtland Creek just south of 35th as I envisioned it happening from north of 35th too. If that’s correct, it would be another example of an offset streamcourse (and a corresponding shutter ridge). As earthquakes and creep affect the landscape here, water could shift from one drainage to another in this area where three different creeks run very close to one another. 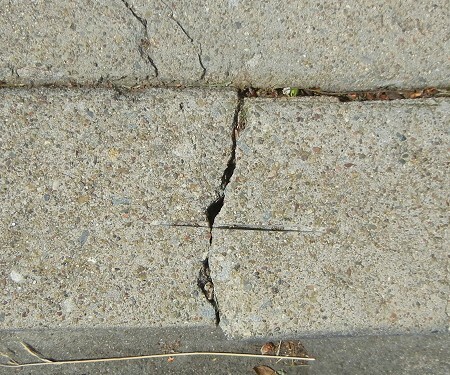 This entry was posted on 3 May 2014 at 4:39 pm and is filed under Oakland geology puzzles, The Hayward fault. You can follow any responses to this entry through the RSS 2.0 feed. You can skip to the end and leave a response. Pinging is currently not allowed. I understand that the Fly casting pond/s Southeast of the reservoir is now completely man-made, but at one time it was a natural waterhole. Is this possibly a sag basin due to the fault line? Also, there is a whole lot of interesting rock on the Eastern side of Highway 13. Did the fault contribute to all that “color”? The old topo maps (browse them starting at http://cluster3.lib.berkeley.edu/EART/CA/sfbayarea/sfhistopo.html) show an ordinary stream valley there. Perhaps there was a marshy meadow, but no more than that. I can’t say whether the fault contributes anything to the scenery along 13. 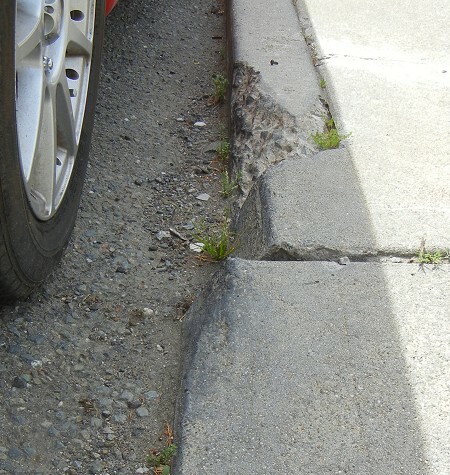 The Bay area has been through a lot in the last few million years, including a lot of faulting, but outside the Hayward fault few or no other faults are active here.